Left: NMM 7126. Right: NMM 7063. Cast plate with raised letters soldered to bell: BY HER 35 [engraved] MAJESTY'S / ROYAL LETTERS PATENT / Royal Arms [lion and unicorn] / KOHLER SOLE MAKER / 35, HENRIETTA STT / COVENT GARDEN LONDON; on side of plate: J, SHAW / INVENTOR. 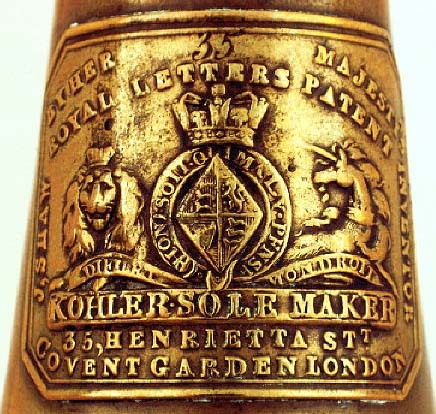 Embossed on garland: KÖHLER MANUFACTURER HENRIETTA ST. COVENT GARDEN LONDON. 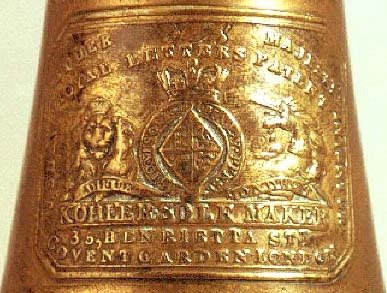 Owner's inscription engraved on back of bell: Scots Fusilier Guards / No 4. Valve cases and touchpieces stamped 1 and 2. 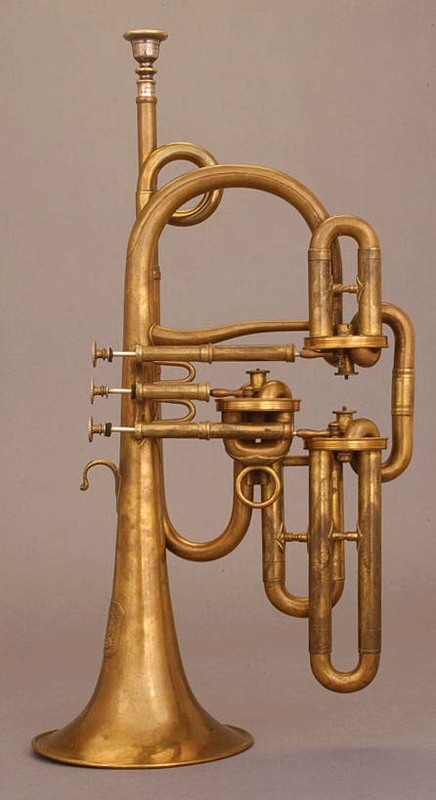 Four-piece (two tube segments, tuning slide, and bell), double-loop brass body. Overlapping tab seam (width of tabs 4 mm). Saxon rim, iron wire insert. Garland with serrated upper edge in semicircular, embossed acanthus-leaf pattern; richly embossed with tendrils below signature. Helically fluted receiver ferrule surrounded with royal flowers (clover, thistle, and rose); other ferrules with six engraved and impressed lines. Two disc valves ("patent lever valves") lowering the pitch a whole tone (first valve) and a semitone (second valve). Clock spring with tension-regulating disc. First valve: inner moving slides; second valve: outer moving slides. Windway: second valve, first valve. Accessories: Conifer case, originally painted green; three single-coiled crooks for E-flat, D, and C; three tuning bits with ears for F (low pitch), E (low pitch), and E (high pitch, not original); two mouthpieces: one German silver, one brass with silver plating, the latter stamped BUTLER LONDON. Sounding length: 1744 mm (F), 1768 mm (F low pitch), 1840 mm (E high pitch, not original), 1861 mm (E low pitch), 1963 mm (E-flat), 2092 mm (D), 2368 mm (C); internal diameter receiver: 11.7 mm, internal diameter minimum (at 32 mm): 10.7 mm; bore diameter: 11 mm (inner slides); bell diameter: 120 mm. Resembles Köhler's two-valve "Patent Lever Trumpet" shown at the Great Exhibition, London, 1851, claiming "that the tones produced by the complementary windways are all insured of equal quality as the new valve [the disc valve] allows a perfectly free and circular passage through the whole windway of the instrument - a desideratum never before attained." Lit. 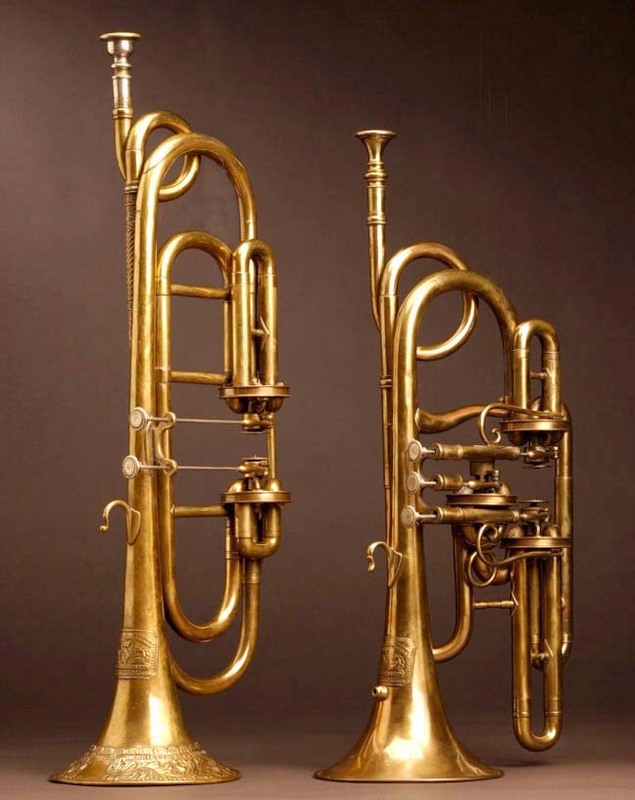 : Sabine Klaus, "Trumpet in F and Cornopean in B-flat by John August Köhler" in "Historical Instrument Window," Edward H. Tarr, editor, International Trumpet Guild Journal, Vol. 31, No. 4 (June 2007), p. 60. Cast plate with raised letters soldered to bell: BY HER 382 [engraved] MAJESTY'S / ROYAL LETTERS PATENT / Royal arms [lion and unicorn] / KOHLER SOLE MAKER / 35, HENRIETTA STT. / COVENT GARDEN LONDON; on side of plate: J, SHAW / INVENTOR. Valves stamped 1, 2, 3. Five-piece (leadpipe, two small bows, tuning slide, bell), single-loop brass body. Overlapping tab seam (width of tabs 2.5 mm, sloping). Variant of French rim, in which the bell edge is rolled inwards; iron wire insert. Ferrules with one engraved line and one impressed line surrounded by two engraved lines respectively. Three disc valves ("patent lever valves") lowering the pitch a whole tone (first valve), a semitone (second valve), and a minor third (third valve). Clock spring with tension-regulating disc. First and third valves: inner moving slides; second valve: outer moving slides. Touchpiece push-rods guided in tubes. Windway: second, third, first valve. Accessories: Funnel-shaped brass mouthpiece with silver rim; three brass crooks stamped F, G and A ; five tuning bits with ears, one stamped B , the others without stamps (one for A, the others for low-pitch alterations). Sounding length: 1370 mm (B-flat), 1456 mm (A), 1510 mm (A-flat), 1634 mm (G), 1836 mm (F); internal diameter receiver: 11.4 mm, internal diameter minimum (at 76 mm): 10.8 mm; bell diameter: 120 mm. 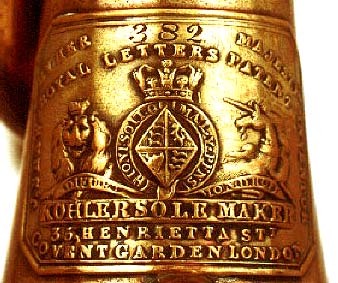 Resembles Köhler's "patent lever cornopean" displayed at London's Great Exhibition, 1851. Sabine K. Klaus, with contributions from Robert Pyle, "Measuring Sound: BIAS Aids Understanding of Brass Instruments," NMM Newsletter 37, No. 3 (December 2010). Cast plate with raised letters soldered to bell: BY HER 858 [engraved] MAJESTY'S / ROYAL LETTERS PATENT / Royal arms [lion and unicorn] / KOHLER SOLE MAKER / 35, HENRIETTA STT / COVENT GARDEN LONDON; on side of plate: J, SHAW / INVENTOR. Valves stamped 1, 2, 3. Five-piece (leadpipe, tuning slide, two small bows, bell), single-loop brass body. Overlapping tab seam (width of tabs 2.5 mm, sloping). Variant of French rim, in which the bell edge is rolled inwards; iron wire insert. Ferrules with one engraved line and one impressed line surrounded by two engraved lines respectively. Three disc valves ("patent lever valves") lowering the pitch a whole tone (first valve), a semitone (second valve), and a minor third (third valve). Return spring in guiding tube of touchpiece push rods. First and third valves: inner moving slides; second valve: outer moving slides. Windway: second, third, first valve. Accessories: black leather case; brass crook stamped F; two brass tuning bits with ears; silver-plated brass mouthpiece with radial throat, made between 1888 and 1937, stamped EMBOUCHURE PAYEE / GUILBAUT / BSGDG / COUESNON & C[I]E / 94 RUE D' ANGOUÊME / PARIS / No. 1.; two crooks, one stamped "SI , the other one LA · B. The parts with French inscriptions are not original. Sounding length: 1399 mm (B-flat), 1480 mm (B-flat, not original), 1514 mm (A-flat, not original), 1781 mm (F); internal diameter receiver: 11.4 mm, internal diameter minimum (at ca. 45 mm): 9.8 mm; bore diameter (inner slides): 11 mm; bell diameter: 122 mm. Differs in some details from the 1851 exhibition model, most notably in the use of return springs in tubes instead of clock springs.